lantic deep water and or circumpolar deep waters. ments and the high fossilization potential of their tests. frizzing temperatures at the poles in the Pliocene . cific and Atlantic oceans during the middle Miocene . deep-sea faunal diversity changed considerably . ter and pore waters, are major controlling variables . raminifera  as on other deep-sea organisms. species-specific relations for different depths and areas. eas of the world Ocean. and 4125 m (N 5º E 65º) in the South West Indian Ocean. all benthic foraminifera were picked and identified . correlate the data generated based on bathymetry . upper ocean mixed layer dynamics are given earlier . distribution were calculated (Table 1). which is reduced during the winter monsoon. Table 1. Benthic foraminiferal species number with depth (m). carbonate tests to be preserved in the deep sea sediments. tion about the deep-sea environments . (1500-2000 m) just below the Arabian sea OMZ . been related to changes in the Indian monsoons . mate forcing during the Pliocene and Pleistocene . overlying waters and organic flux to the sea floor . might have been linked to the supply of organic food. 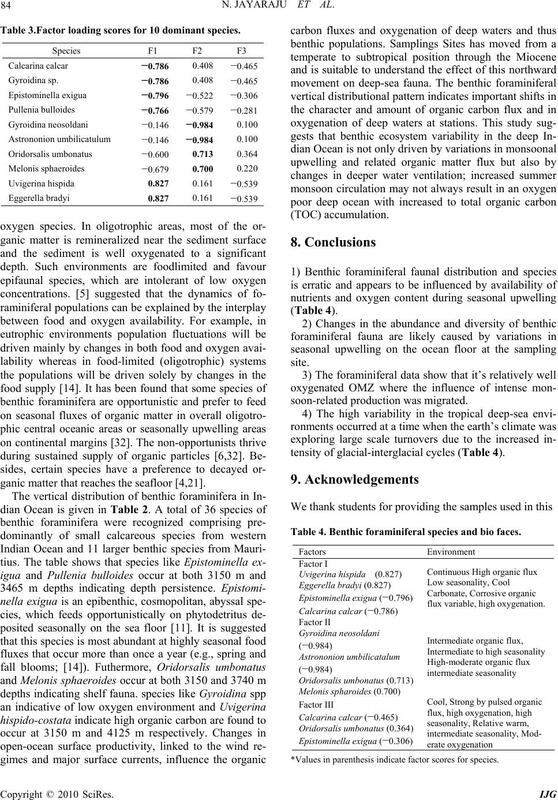 bulk sediment) of benthic foraminifera fluctuate largely. Eggerella bradyi and Karreriella bradyi. Factor 3 (10.83%) accounting for 72.81% (Table 3). variable and high oxygenation . umbonatus (0.713) and Melonis sphaeroides (0.700). intermediate high seasonality, refractory organic matter. sonality, and moderate oxygenation . seasonality, moderate oxygenation is also reflected. Table 2. Pearson correlation matrix of 10 dominant species. Table 3.Factor loading scores for 10 dominant species. ganic matter that reaches the seafloor [4,21]. tensity of glacial-interglacial cycles (Table 4). Table 4. Benthic foraminiferal species and bio faces. 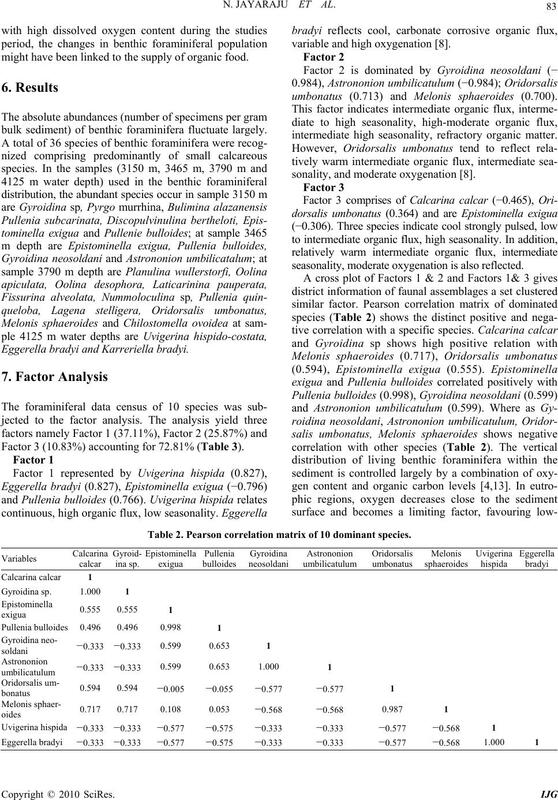 *Values in parenthesis indicate factor scores for species. proved the manuscript and are grateful acknowledged. Sea as Revealed by Plantonic Foraminifera,” In: W. L.
Texas, Vol. 117, 1991, pp. 257-264. Ocean,” Nature, Vol. 421, No. 6921, 2003, pp. 354-356.
leooceanography, Vol. 14, No. 1, 1999, pp. 111-124.
rine Geology, Vol. 31, No. 1-2, 1979, pp. 115-138. Deep-Sea Research, Vol. 43, No. 9, 1996, pp. 1395-1421. 65 Ma to Present,” Science , Vol. 292, No. 5517, 2001, pp. Circulation,” Nature, Vol. 393, No. 6686, 1998, pp. Monsoons?” Geology, Vol. 32, No. 9, 2004, pp. 753-756.
leogeography, Vol. 16, No. 1, 2001, pp. 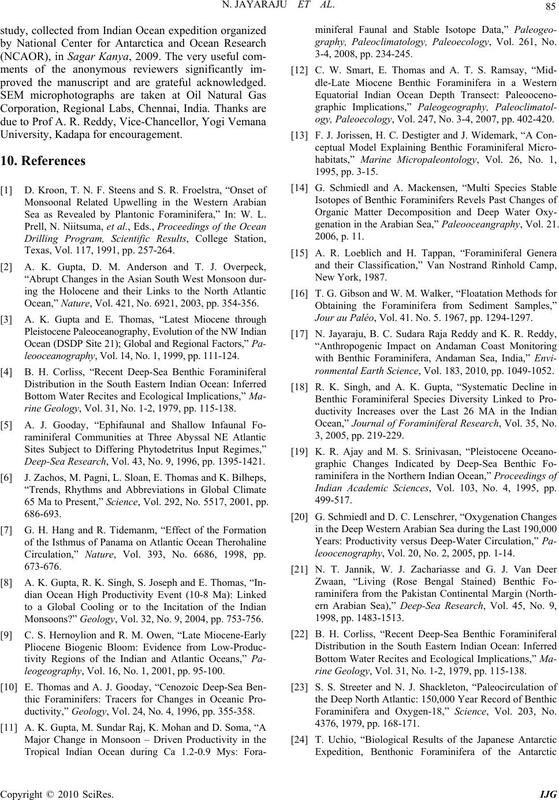 95-100.
ductivity,” Geology, Vol. 24, No. 4, 1996, pp. 355-358.
graphy, Paleoclimatology, Paleoecology, Vol. 261, No. ogy, Paleoecology, Vol. 247, No. 3-4, 2007, pp. 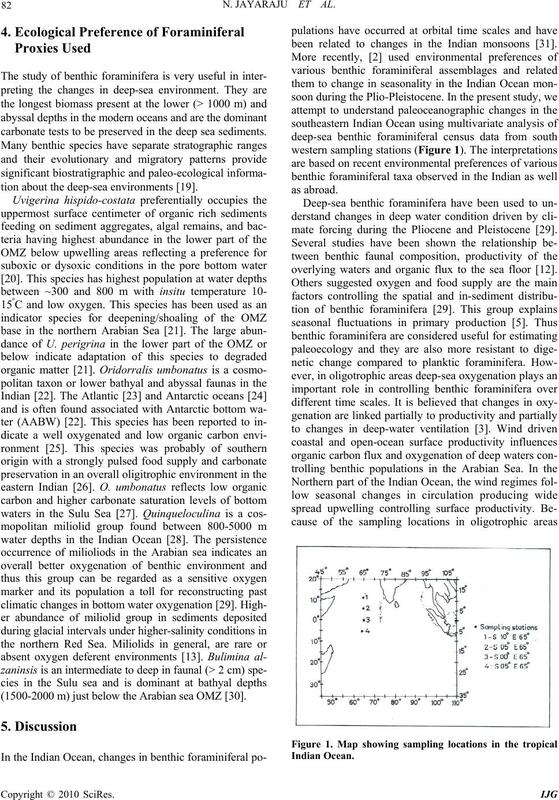 402-420.
genation in the Arabian Sea,” Paleooceangraphy, Vol. 21. Jour au Paléo, Vol. 41. No. 5. 1967, pp. 1294-1297.
ronmental Earth Science, Vol. 183, 2010, pp. 1049-1052. 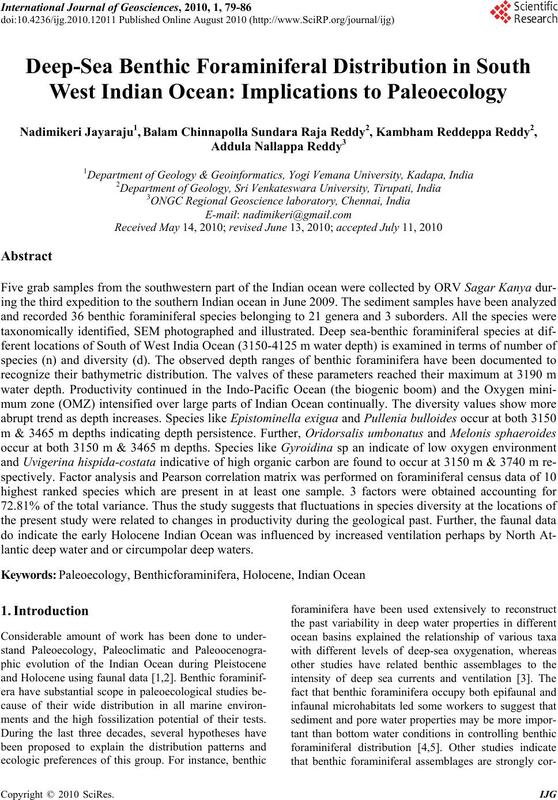 Ocean,” Journal of Foraminiferal Research, Vol. 35, No. 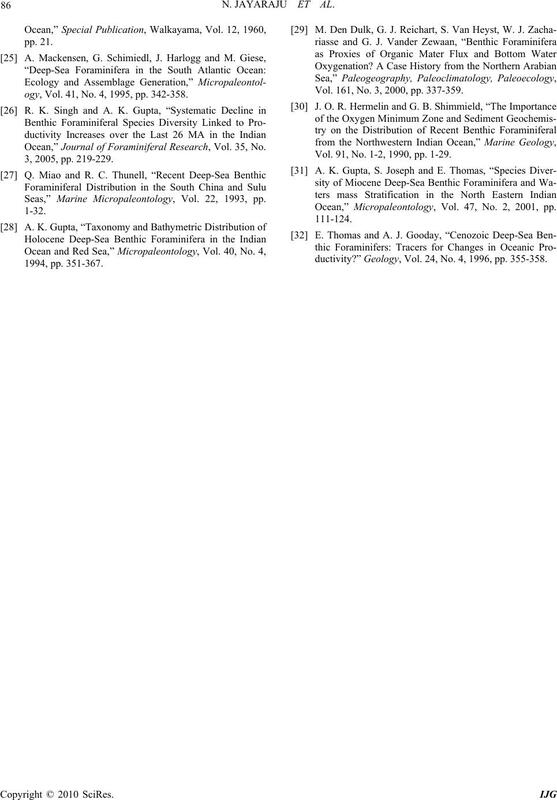 Indian Academic Sciences, Vol. 103, No. 4, 1995, pp. leoocenography, Vol. 20, No. 2, 2005, pp. 1-14. Foraminifera and Oxygen-18,” Science, Vol. 203, No. ogy, Vol. 41, No. 4, 1995, pp. 342-358. 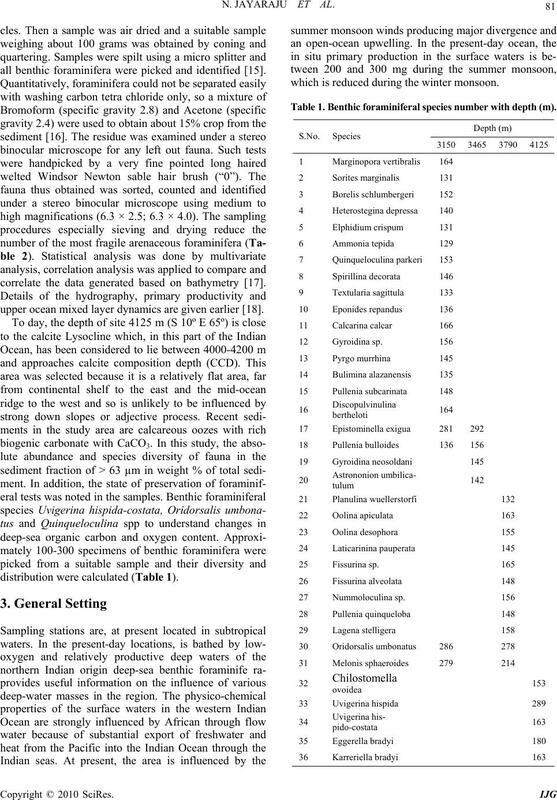 Seas,” Marine Micropaleontology, Vol. 22, 1993, pp. Vol. 161, No. 3, 2000, pp. 337-359. Vol. 91, No. 1-2, 1990, pp. 1-29. 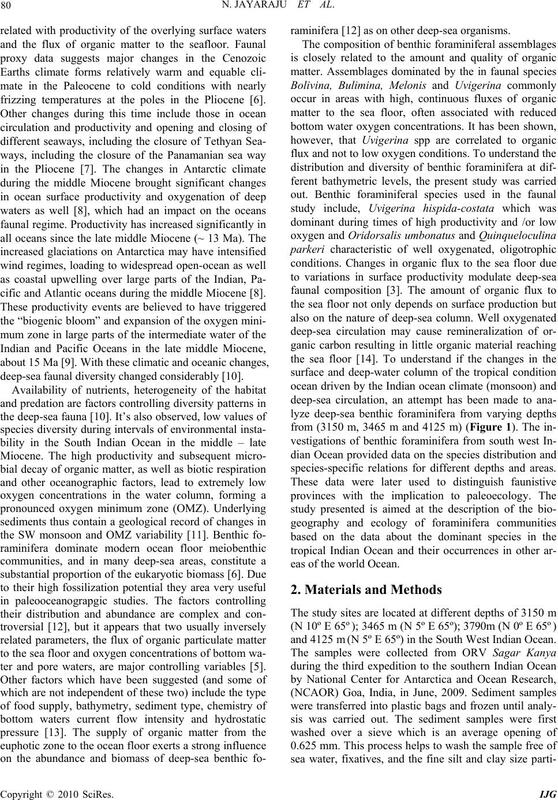 Ocean,” Micropaleontology, Vol. 47, No. 2, 2001, pp. ductivity?” Geology, Vol. 24, No. 4, 1996, pp. 355-358.